In 1979 six teachers employed at the Hopevale School undertook 20 days of industrial action, the longest in the history of the Queensland Teachers’ Union (QTU). They acted in support of a colleague who had been transferred out of the area as a punishment for his involvement in local Indigenous community issues. As well, several other North Queensland schools undertook industrial action in support of the campaign, with 13 stopping for 24 hours. This dispute involved the human rights of teachers, students and the local indigenous community to speak up for themselves and the right to a public education free from the interference of outside non-education political and religious authorities. Hopevale is located 52 kilometres north west of Cooktown in Far North Queensland. In 1979 the local school was on an Aboriginal Reserve subject to strict Queensland Government legislation under the control of the Bjelke-Petersen state government. It was also a Lutheran mission with influential church authorities having a say over school staffing and education programs. Unlike most other Queensland state schools at the time, authorities outside the Education Department had influence over the running of the school. The most powerful authority was the Queensland Department of Aboriginal and Islander Affairs (DAIA). In 1979 the school was in a transition process from a church-controlled mission school within an Aboriginal Reserve to a state school within the normal government education processes. My involvement in this dispute arose from my appointment, in August 1979, as the QTU North Queensland Organiser based in Townsville and covering teacher members across all of Northern region, including Hopevale. I worked closely with the teachers to assist in promoting their message to the wider teacher and Queensland communities. 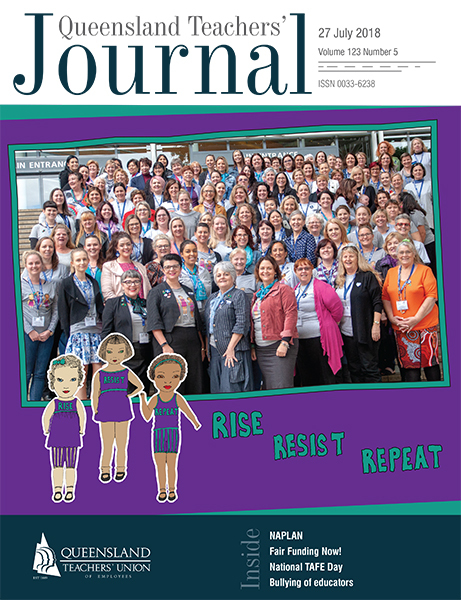 The motivation for recalling and writing about this matter is to ensure that the teachers directly involved in this dispute, both in Hopevale and beyond, receive greater recognition and praise for their actions; and to restore this dispute to its rightful place in the history of the QTU. The teacher at the centre of this dispute was in his 30s and had been appointed to the school (with Lutheran Church approval) at the start of the 1978 school year to teach year seven students. He was a competent teacher respected for his education work by the principal, fellow staff, students and the local community. As an outspoken and mature age teacher he was supported by his younger colleagues for his willingness to stand up against the unfairness of the authoritarian reserve system at Hopevale. Concerns existed in the Hopevale community regarding various aspects of life, including the local farming and work arrangements, the Cape Flattery silica mines with their discriminatory employment policies (including the lack of suitable worksite accommodation for Indigenous workers) and the inadequate mining royalty payments for the local communities, the ignoring of the concerns of the Hopevale Indigenous people and the external influence and control of the community authorities and management. There was a long history of neglect of Hopevale community concerns by the external authorities, particularly the DAIA and their local management representatives. Evidence for this was provided in reports provided by the Lutheran Church of Queensland in 1978 and the Queensland Department of Education in 1979. In 1978 the Lutheran Church’s Queensland Council sent a task force of representatives to Hopevale (as well as Bloomfield and Cooktown) to investigate and report on concerns within the various communities and congregations. The group of three Lutheran ministers visited Hopevale on 12-15 and 21-28 June 1978. The investigation arose out of concerns raised by local people, including a lack of consideration of community needs by the authorities, too much external state government control and a lack of employment and other opportunities for the local Indigenous people. Recommendations made in this report included improved communication lines, greater attention to the concerns of the Hopevale community, acceptance of visits by people of various political persuasions and better contact between non-Indigenous staff and the local people. Also recommended was the greater use of local Indigenous people as the management staff. The teacher at the centre of this dispute had strong convictions about justice, human rights and community advancement. He became concerned with the reserve administration and the lack of attention to the needs of the local people. As a result he became involved in Hopevale community activities. One area of involvement was the regularly held community administration meetings. These meetings were meant to be advisory to the Aboriginal Community Council. One specific area of concern raised at these meetings was the work of a recently appointed farm supervisor who was attempting to improve productivity, community involvement and outcomes. On 10 July 1979 an evening administration meeting was held and this matter was discussed and the minutes were subsequently published. A number of people (including the teacher and the school principal) who had been at the meeting agreed that the part of the minutes negatively referring to the farm supervisor were grossly inaccurate. The teacher and other community members attempted to remedy the situation by calling another meeting to rectify the minutes. The subsequent meeting was held (24 July 1979) and the references to the farm employee were corrected. Local management authorities referred to this meeting as ‘illegal’ (despite the advisory nature of it) and complaints were made to external DAIA authorities. On 31 August 1979 the teacher attended a public council meeting before school. The teacher sought and received the permission of the principal to allow years six and seven to attend as a social studies activity if they wished to do so, and some did attend. At one stage of the meeting police removed an Indigenous man who was attempting to speak in support of the recently dismissed farm supervisor. The teacher asked the police what authority they were using. There was no reply and the man was removed to a police lockup, but he was neither arrested nor charged. Following this meeting, the teacher was again subject to management complaints to the DAIA and Lutheran Church authorities. Four days later he was advised by the Education Department of his transfer to Gladstone West School. This was despite his year seven class having only a little over one term to go at the school and the fact that his wife was a health department employee in Cooktown. On 12-13 September 1979, the Northern Regional Inspector (Primary) visited the Hopevale community and school to consider the grounds for the transfer of the teacher. Initially the Inspector was accompanied by a QTU official, but he had to withdraw on the first day due to a serious illness. This evidence was backed up by the petition signed by 201 members (out of the 210 adults) of the Hopevale community (including three of the five members of the Aboriginal Council) requesting that the transfer not be proceeded with. The Inspector recommended that the teacher’s transfer be delayed until the end of the school year out of concern for the students and to show some compassion rather than it be perceived as solely ‘punitive’. The Education Department, under pressure from the DAIA (Pat Killoran Director) and state government politicians (the Premier Joh Bjelke-Petersen and the Minister for Aboriginal and Islander Advancement Charles Porter), rejected the recommendation. The Education Department Director General (Clyde Gilmour) at the time conceded that the transfer was made at the request of the DAIA and some Lutheran Church authorities. Following refusal of the Education Department to postpone the transfer to the end of the year, the teachers voted to go on strike. The strike began on 4 October 1979. Soon after the teacher and myself (as the QTU Regional Organiser) were given notice of eviction from the community by the Aboriginal Council. It was clear that the evictions were demanded by the DAIA and state government politicians in Brisbane. The teachers also left the community in response to the evictions. The teachers returned to work on 1 November 1979. The teacher at the centre of the dispute reluctantly had to accept a later transfer but was also further punished with a pay reduction for his defiance of the authorities. Teachers from 13 other North Queensland schools, many of whom had direct experience or were aware of the conditions in reserve communities across the Northern Region, undertook industrial action (24 hour stoppages in the September – October 1979 period) in support of the Hopevale teachers. Ballots were arranged by the QTU in these schools and the school Union Representatives or myself as the Union Regional Organiser helped organise the voting. Understandably concerns have been raised at the costs of such a prolonged and uncompromising school dispute. Of particular concern was the effect on the education of the Hopevale students. It should be noted, however, that the then Hopevale teachers, the QTU and an Education Department inquiry recommended to the political hierarchy compromises in the dispute but they were all refused. For example, the request to delay the teacher’s transfer until the end of the school year (recommended by an Education Department Regional Inspector who visited the community at the time and supported by the QTU) to minimise the disruption of the year seven class program was rejected by the government. Also jointly offered was a transfer of the teacher to the nearby Cooktown School. The teacher’s wife was employed by the Health Department in Cooktown. Again this was refused by the state authorities. As well somewhat overlooked in this dispute was the extra outside-of-school lessons that the teachers provided for the students during and following the strike action. In the longer term, much was gained from this difficult dispute. The direct involvement of outside religious and political forces in indigenous public education was removed. The Incentive Transfer Scheme was expanded to encourage increased stability and quality at remote area schools. Appeal procedures were put in place for transfers likely to cause excessive hardship for a teacher and their family. The right of entry of union officials to all education worksites was maintained. Overall the acceptance of teachers’ normal civil rights and improved conditions within Indigenous communities was granted. We must thank the 1979 Hopevale teachers and their supporters for these outcomes. Also thanks to the QTU for allowing the author access to the Union’s Hopevale dispute file. Report of Hopevale – Bloomfield – Cooktown (Queensland Lutheran Church) Visitation Submitted by H.P.V. Renner, K.H. Kirsch and G.L. Rose 11 – 29 June 1978. W.F. Kohlmann Report on Investigation at Hopevale State School 20 October 1979. Report of Investigation at Hopevale State School N.R. Town Queensland Department of Education Regional Inspector (Primary) Northern Region 12 – 13 September 1979. Report on The Hopevale Dispute Stuart Mac Donald Queensland Teachers Union Northern Regional Organiser 12 October 1979. The Hopevale Teachers Re: Hopevale Dispute 31 October 1979. Queensland Teachers Union News Flash ‘Hopevale Dispute Unresolved’ 16 October 1979. Queensland Parliament Hansard 16 October 1979 – ‘29 Transfer of Teacher from Hope Vale Mission School’ – Question Time. Historic Hansard Senate Debates 23 November 1979. Camden, Debbie “My Husband Paid Price ...” Telegraph 25 August 1980. Peake, Ross “Row as Mission groups put ban on Union Official” Courier Mail (page 3) 10 October 1979. Andrews, N.R. Solicitor letter to the Chairman of the Queensland Public Service Board on behalf of Hopevale teacher 14 December 1979. Petition signed by members of the Aboriginal Community of Hope Vale re teacher transfer – September 1979. The teachers are not identified in this paper as I have been unable to contact them to get their permission. Concerns included the lack of accommodation on site for the wives of aboriginal employees as compared to the arrangements for non-indigenous employees. Also issues with the inadequate payments to Mission authorities by the Japanese mining company and the role of State government politicians in the mine’s approval and entitlements. SENATE Debates 23 November 1979 page 91. Report of Hopevale – Bloomfield – Cooktown (Qld Lutheran Church) Visitation 11 – 29 June 1979. Ibid pages 80 – 82. Report of Investigation at Hopevale State School Regional Inspector (Primary) Mr. R. Town Qld Department of Education 12 – 13 September 1979. Hopevale community petition September 1979. Qld Conciliation and Arbitration Commission hearing 6 September 1979 admissions by Qld Education officers including George Berkeley Assistant Director General.